How will history remember Gamer Gate? Our industry is in flux. Extreme sides trying to pull it in opposite directions, neutral people being thrust one way or another. People can try to stay neutral, as I had tried to stay neutral. As the influences scar the landscape, it is beginning to seem neutrality is less and less possible. Gaming has been scarred, and these are scars that are not going to be forgotten any time soon. This comes to my concern. How will history remember GamerGate? There is a narrative being espoused that angry male gamers are lashing out at progressive voices, many female, for a perceived attack on their culture. Any reputable source you can name will have content aiming to prove some variation of that point. Looking back at this time, it would be almost impossible not to come to that conclusion. A conclusion that is devoid of nuance and ultimately disingenuous. And that is the purpose of this piece. 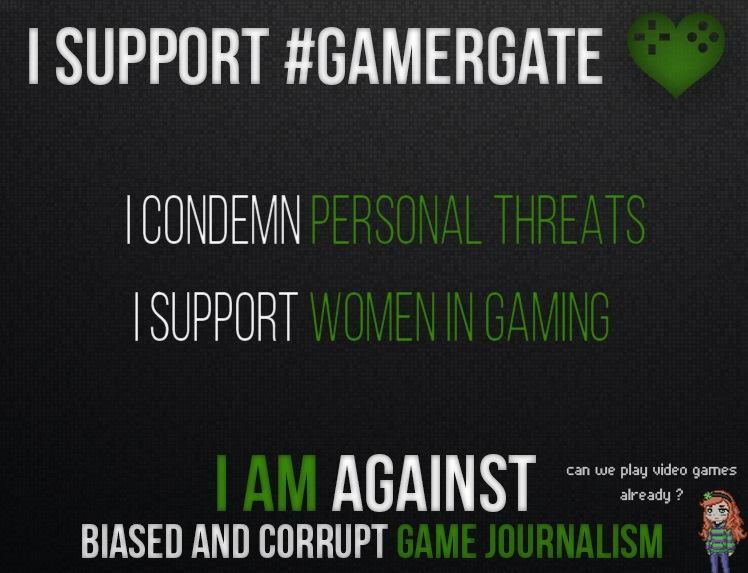 I will attempt to demonstrate a view and perspective that is not being reported on in mainstream gaming publications. In fact, it is being actively censored, effectively trying to erase the record of any opposing view, regardless of who it is coming from. ﻿﻿I will show that gamers are not a homogenous collective, but rather a vibrant and diverse sub-culture. I will show that GamerGate is not movement born of hate to squash women out of the industry, but rather a grass roots consumer revolt of people who just really like video games. On August 15, 2014, the ex-boyfriend of game developer Zoe Quinn posted a Wordpress blog entitled The Zoe Post. In it, he detailed information pertaining to their relationship, including chat logs he felt showed how she emotionally abused him. Also included was a list of 5 men he claimed she had cheated on him with. Hell Hath No Fury Like a Lover Scorned, as the adage goes. A scandalous and inflammatory story, it is little wonder critics of her game and character were drawn to the accusations. This was the beginning of the movement that would take off to become Gamer Gate, a fact that critics of the movement would latch onto as proof of ill intent towards women in the industry. This would be used to attempt to discredit the entire movement time and time again. To say however that Gamer Gate is is caused by Zoe Quinn is like saying World War One was caused by Arch Duke Ferdinand. It was not that a female game developer had a series of affairs. This became something more than the escapades of an unfaithful lover. It was the revelation of who some of these men were that she was having affairs with. Several prominent members of the independent games scene, including judges of awards that she had won. However, it was one of those five names that would prove to be the catalyst for a gaming culture war that had been on the verge of eruption for some time. That name was Nathan Grayson. This name is important because he is a journalist for one of the most visited gaming sites online, Kotaku. Prior to that Grayson wrote for Rock Paper Shotgun, another popular outlet. At this point, it becomes an issue of the integrity of a journalist, as well as calling into question the integrity of the entire publication. The community looked to Kotaku Editor In Chief Steven Totilo, who has a masters degree in journalism, to see how the publication would address the accusations. "Nathan and I have discussed this and he assures me that at the time of that article he has not begun a relationship with the developer." It is generally frowned upon for a journalist to mention potential conflicts of interest to his editor in chief only after they have been made public. Kotaku, again, is one of the largest gaming news sites on the web. We shall examine some excerpts from the articles Grayson had written involving Depression Quest, the game Zoe Quinn created. The first is from Rock Paper Shotgun dated January 8th, 2014 in an article entitled Admission Quest: Valve Greenlights 50 More Games. As we are talking about this I want you to keep in mind that the author of the Zoe-post, her ex-boyfriend, has identified the affair between her and Grayson as happening sometime in between the time period of April 1 and April 6th of 2014. 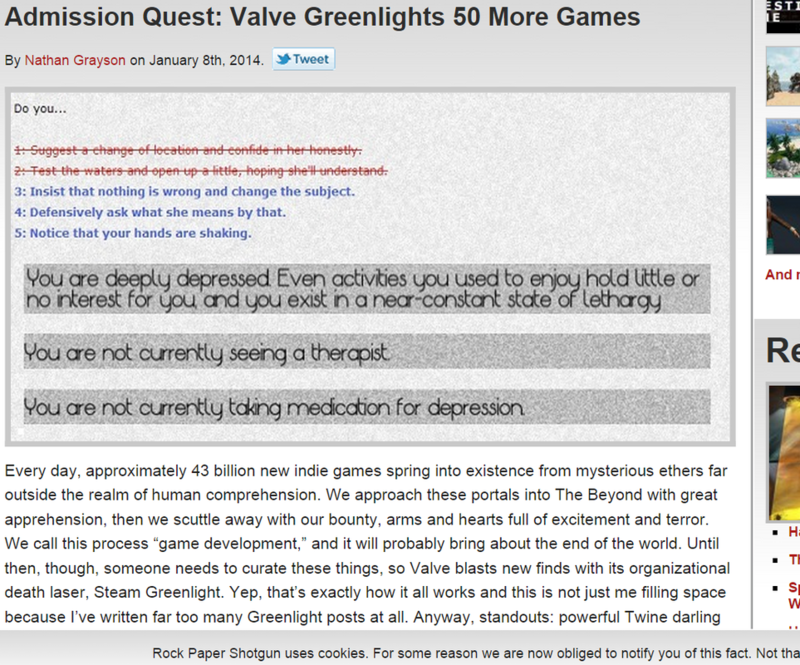 On January 8th, Grayson writes an article whose title is a play on the name of Quinn's games, whose image is a screenshot of her game, and out of 50 games that would now be sold on Steam, he mentioned three by name, one of which was Depression Quest. Perceived impropriety can be as damaging to a news site's reputation as any actual impropriety. In light of what would happen, it calls into question the writer's motives.